This is the 3rd of 3 on our Pretty Pink Christmas Stockings. 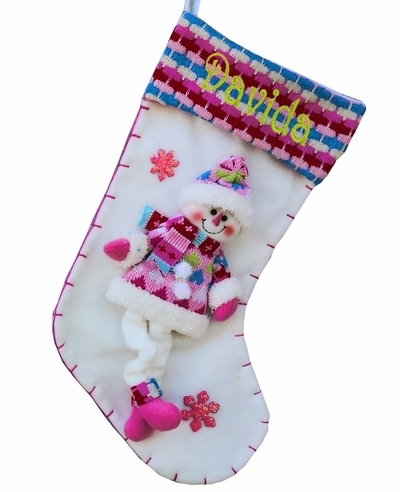 There is a Pink lover in all of us and this stocking is perfect to satisfy the want for Pink. We also have Pretty Pink Santa and Pretty Pink Reindeer in the Pretty Pink Collection. Materials: Base is soft with exterior covered with chenille knits, metallic fabrics, fleece patches and the snowflake decorations on the stocking body are white plastic sparkled with shimmering glitter. Lining: The Christmas stocking is not lined- inside it is constructed of heavy in red or green matching felt on the inner body and you can load it up with lots of stocking stuffers.